Note: Most "Saloons" listed may not have been drinking and gambling houses. The word saloon comes from the French word "salon"
and in the mid 1800s would apply to most businesses that wished to imply a grand hall with fine fixtures, where folk could socialize. Considering the name, i.e. Billiard Saloon, Barber Saloon, etc. you can sort out the establishments that did not serve spirits. 1850-55 Bassett's Saloon (South of Pioneer Emporium lot). 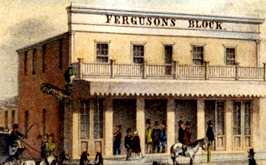 1851-53 Ferguson's Liquor Store (Pioneer Emporium lot) . 1851 Patterson House Saloon with owners Henry Dawson and John D. Patterson. The saloon was a wood frame building located on the lot of the where J. C. Miller's Carpentry. 1852-54 Captain Raspal's Billiard Saloon (San Francisco Store lot). 1852-57 Ferguson's Saloon (Pioneer Emporium). 1852 Italian Saloon. Located on State & Main Streets (southeast corner) this lot had a wood structure owned by Luigi Mariet. 1853-57 Colombo Saloon (so. corner of State & Main). 1853 Doutremont Saloon (Location unsure). 1853-57 H. K. White's Billiard Saloon (Candy Kitchen). 1854-55 Barclay's Saloon AKA Lone Star/Martha's Saloon (California Store lot). 1854 English Ale & Porter House (Location unsure). 1854-57 Morgan's House (City Hotel). 1855-66 Donnell & Parson's Saloon (Location south of blue wagon). 1855 Koch Saloon (Location unsure). 1855 Kossuth Saloon (Fancy Dry Goods). 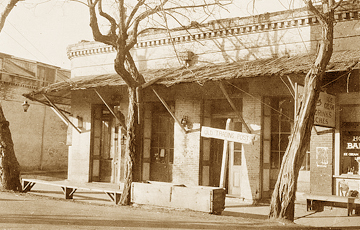 1855-57 Martha's Place was renamed, Lone Star Saloon & Coffee House (California Store lot). 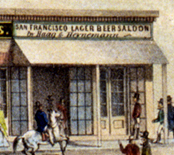 1855-61 Haag & (Louis) Heynemann's Lager Beer Saloon AKA San Francisco Lager Beer saloon. (Brown's Coffee & Sweets Saloon). 1855-today What Cheer Saloon. Part of the Morgan House. (City Hotel) 1857 it is called What Cheer House Saloon. 1856 E. J. Parrott Saloon (Location unsure). 1856 B. Harvey Saloon (Location unsure). 1856 Charles (Chas.) De La Royere's Wine & Liquor Store (Location unsure). 1856 Columbia Lager Beer & Bowling Saloon (Location unsure). 1856 F. Weyer Saloon (Location unsure). 1856 Hanson's Saloon (just south of California Store/Franco barn). 1856-65 Hoerchner Saloon (Location unsure). 1856-60 J. H. Ward Saloon AKA Ward's Drinking Saloon (Location unsure). 1856 Jos. Mavro Saloon (Location unsure). 1856 L. D. Loring Saloon (Location unsure). 1856 Lager Beer Saloon (Location unsure). 1856 M. J. Keating Saloon (Location unsure). 1856 Pioneer Saloon (Location unsure). 1856-65 Schultz' German Hall (Location unsure). 1856-71 St. Charles's Saloon. AKA Charles Ream's Saloon or Reim's St Charles Saloon. 1856 T. H. Lineker Saloon (Location unsure). 1856 W. H. Warren Bowling Saloon (Location unsure). 1857 Brazee's Hall (Location unsure). 1857-69 Jack B. Douglass Saloon on the corner of Fulton and Main Streets. 1857-65 Long Tom saloon (just north of California Store/Franco). 1857 August - Morgan's What Cheer House Saloon. 1857 Oppenheimer and Rehm oyster parlor and saloon (Brown's Coffee & Sweets Saloon). 1857 Saloon & Oyster Parlor. 1858-59 Kellerman's Ten Pin Alley. 1858 Lager Beer Saloon (just south of California Store/Franco barn) . 1858 Bill Rainey's Gambling House. (Location unsure). 1858 Oppenheimer Saloon (Brown's Coffee & Sweets Saloon) . 1858 Terpsichorean Hall Saloon (east of Masonic Hall) . 1859 Seibert, Bakery and Coffee saloon (just south of California Store/Franco barn). 1859-65 Manning's Saloon (Not sure of location). 1859 Oyster & Coffee Saloon, Rehm's (St.Charles saloon) . 1860 June 1 - Mariquita Martines and Margareta Moscoso (30 yr old from Chile) buys a parcel of land from Henry Smith that is on the west side of Main Street, above Jackson Street for $157.50. It is 25 feet in front and 110 feet deep. (Deeds Vol. 10 page 164) (Eastman Vol.9 page 138) Willie Minor 28 yr. old female from Jamaica is listed as a barkeeper living with Josfa Rojas in 1860 census. 1861 Rehm's St. Charles Saloon. 1861 P. G. Ferguson's Wholesale Liquor Store. 1865 Kline's What Cheer & Coffee Saloon . 1865 Kordmeyer & Snyder's Saloon (Hildenbrand bldg). 1870 McGowan's saloon (St. Charles Saloon). 1871 Pay Ore Saloon (Towle-Leavitt). 1879 Eagle Restaurant & Billiard Saloon (Towle-Leavitt). 1880 Big Tree Saloon (Towle-Leavitt). 1880 David Levy's Dividend Saloon (Franklin Wolfe). 1880 Henkleman's Saloon (Bottom of Duchow Building/Drug Store). 1887 Rehm Billiard Saloon and Wine Hall (St.Charles saloon). 1889 Siebert's Saloon (Jack Douglass Saloon). 1898 Court Exchange Saloon, The (Bottom of Duchow Building/Drug Store). 1898 Pitt's & Carder's Blue Wing Saloon (Bottom of Duchow Building/Drug Store). 1898 Wild Horse Saloon, The (Bottom of Duchow Building/Drug Store). 1899 Pay Ore Saloon (Towle-Leavitt). 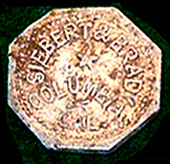 American Saloon Token - c1902. 1902 American Saloon (Jack Douglass). 1906	Dec. 20 - St. Charles Saloon deeded to James and Mata Carder. 1910 St. Charles Saloon called The Peerless Saloon operated by Carder and Rodden. 1930 Stage Driver's Retreat (Jack Douglass Saloon). 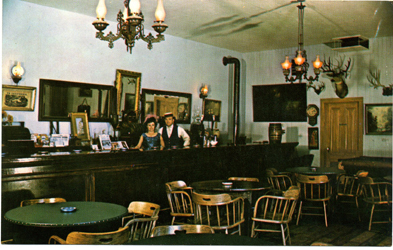 1968-today Jack Douglass Saloon, The. 1910 Peerless Saloon (St. Charles). 1935 Carlo's Pioneer Saloon (St. Charles saloon). 1947 Pioneer Saloon (St. Charles saloon). 1961-68 Pioneer Saloon (St. Charles). 1968 Building restored. Name changed to St. Charles Saloon. The concession is temporarily (15mos) housed at Questai building on State Street. 2013-2015 St. Charles Saloon changed to The Bixel Brewery. 2o16- St. Charles Saloon is back. NOTE: Most "Saloons" listed may not have been drinking and gambling houses. that wished to imply a grand hall with fine fixtures. Also the list is not a complete one and may have errors. City Hotel Bar Token - c1890s.